Here is a unique reusable capsule suitable to any Nespresso® coffee machine. New 5th generation of reusable capsules Recapsule®, with increased resource. Reusable Nespresso capsules can equip any varieties of ground coffee (normal grinding — espresso) and tea and herbs.Poured into reusable capsule quality coffee, we use 19 barrels of Nespresso coffee machines, we get a wonderful drink. Not inferior coffee, prepared with good disposable capsules.Reusable Nespresso capsules are made of quality food grade plastic, membrane filter made of stainless steel mesh. The capsules do not infringe the principle of using the machine and affect its lifetime just as ready. One capsule can withstand at least 40 times. 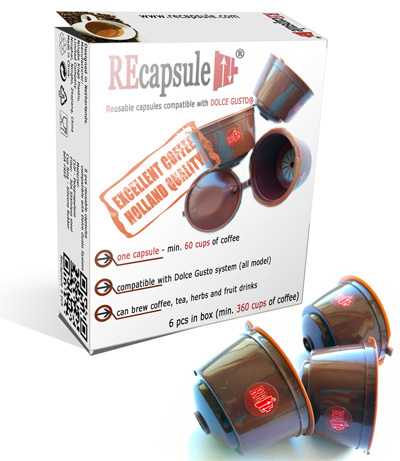 Reusable capsule Recapsule® compatible with Nespresso system: Maestria, U, Pexie, Citiz, Lattissima, Essenza, Inissia. New capsule Recapsule® perfectly with Dolce Gusto system. Suitable for all models of Dolce Gusto® coffee machine. Reusable Docle Gusto capsules can equip any varieties of ground coffee (normal grinding — espresso) and tea and herbs.Poured into reusable capsule quality coffee, we use 15 barrels of Dolce Gusto coffee machines, we get a wonderful drink. Not inferior coffee, prepared with good disposable capsules.Reusable Dolce Gusto capsules Recapsule® are made of quality food grade plastic, membrane filter made of stainless steel mesh. The capsules do not infringe the principle of using the machine and affect its lifetime just as ready. One capsule can withstand at least 60 times. 1) Remarkable quality coffee, tea and herbal drinks. 3) Capsules never run out suddenly. 4) Respect for the environment.